Charles Divers and Marian Merrill, during Visitor’s Day at Camp Grant, 1918. Camp Grant is an army post just outside of Chicago. 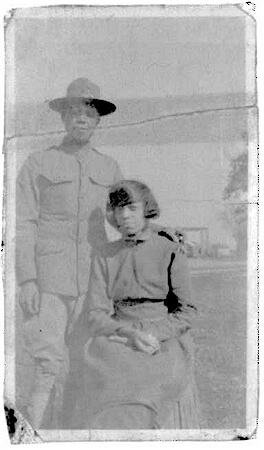 America didn’t enter Word War I until 1918 and the duration of its participation was only about a year so by the time my father was done with basic training in September, the war was almost over, coming to an end the following November before he could be shipped overseas to France. With the prospects of widowhood greatly reduced by these circumstances, my mother then consented to marry him. My parents were both among the early arrivals during the great migration, my father journeying to Chicago from Kansas in 1914, and my mother coming up from Tennessee 2 years later in 1916.. One of his first jobs was as a waiter in the dining room of The Auditorium, one of Chicago’s finest hotels where the all-black staff was required to wear tuxedos. He was fired from this job when he was caught selling boot leg whiskey to the hotel occupants. He later went to work as a Pullman porter for the railroad. My mother worked as an elevator operator in a vaudeville theater, her uniform being a red outfit trimmed in gold braid, and my father would join her on their lunch hour when they would sneak up to the balcony and from the back of it, view the acts of some of the most famous burlesque stars of the day, On one of their lunch hours, they skipped the show and went down to city hall and got married. Enrolling in night school, my mother also took courses at Madam C. J. Walker’s college of hair care. They left Chicago in 1922 and moved to one of its western suburbs, becoming a residents of a town that had been integrated since its founding in 1867. During World War I I my brother served on the USS Mason, the only vessel manned by an all-black crew who 50 years later were awarded medals for valor from the Secretary of the Navy at the behest of President Bill Clinton. Read Part 2: “Opal’s Jim Crow Blues” Cheryl Wills.